Although simple, hand washing habits using soap is an effective way to prevent colds and flu. Bacteria and viruses can infect the body through dirty hands, so this habit will reduce the possibility. Washing hands with soap at least need to be done before and after meals, after going to the toilet, and when taking a shower. Vitamins are needed to keep the body in top condition. You can get vitamin C from citrus fruits, guava, and papaya. In addition, to improve the body’s immune system, we need to increase the intake of phytochemicals. These substances are found in vegetables and fruit as forming colors, smells, and tastes. Phytochemicals optimize the function of the vitamins you have consumed. The body becomes more immune to diseases, including flu and colds. Everyone knows that cigarette smoke is not good for health, both for active smokers or people who are inhaled by cigarette smoke (passive smoking). Cigarette smoke can reduce the body’s immunity, making it easier to get infected with cold and flu viruses. In addition, cigarette smoke also makes the channels inside the nose dry and the fine hairs of the nose diminish in function. Though the fine hairs in the nose play an important role to dispel the virus that wants to enter through the nose. 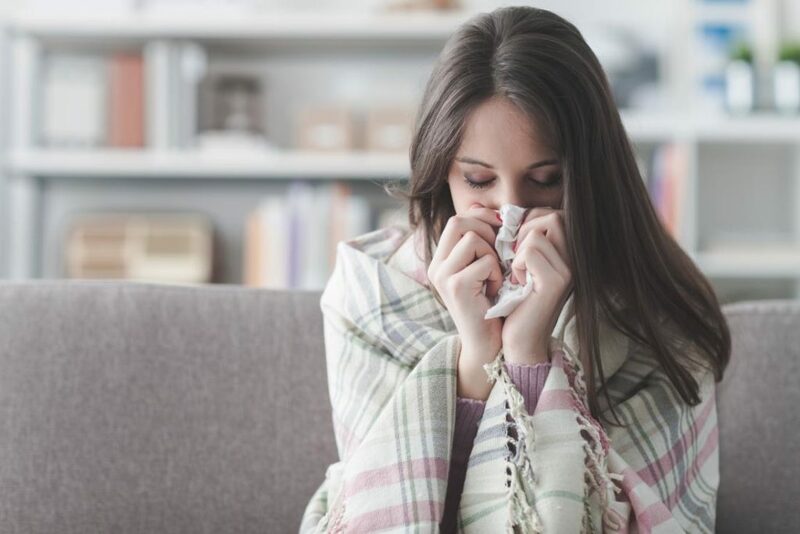 Apparently, even stress can increase the risk of getting colds and flu. 3The condition of stress makes the body’s immune system decrease so susceptible to disease. Need awareness to always motivate yourself so as not to be stressed with the situation, especially in big cities like Jakarta. Learning relaxation techniques while working can reduce stress levels. In addition, you also have to recognize yourself further, recognize things that make you happy and occasionally do it to reduce the pressure of the mind. Viruses that cause flu and colds are scattered in various crowded places such as schools, markets, terminals, and offices. When in crowded places, to avoid spreading the virus through the air, you can use a mask. Regular exercise on a daily basis can also increase body vitality. If you are unable to exercise heavily, you can do mild aerobic exercise. In addition, walking or cycling for 30 minutes a day is also very good for maintaining health. Perform regular exercise habits every day to get optimal results. Various methods above, if done continuously, will make the immune system stronger. A strong body certainly will not be easily attacked by diseases that can interfere with your activities. You can visit “Canadian Pharmacy” to find relevant information and to find the right medicine.